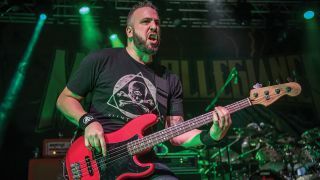 Everyone loves a supergroup, not least in heavy metal world, so when Metal Allegiance formed back in 2014 with members of major names in the world of unsociably loud music, they received a warm welcome. The brainchild of bassist and longtime music industry ‘face’ Mark Menghi, MA also featured ex-Dream Theater drummer extraordinaire Mike Portnoy, Megadeth bassist David Ellefson, Testament guitarist Alex Skolnick and guest vocalists from the great and the good. A self-titled album appeared in 2015, followed by the Fallen Heroes EP in ’16, and now a second full-length titled Volume II - Power Drunk Majesty is on the way featuring another host of celebs on the mic. 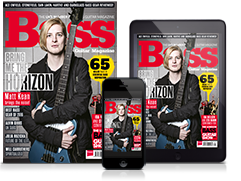 Alex Skolnick: "Being on a track with Joe Satriani made it feel very real - time to up the game!" As with the first MA album, Menghi is one of two bassists on the new record, the other being the almost terrifyingly skilled David Ellefson. Gear-wise, Menghi stuck with a tried-and-tested setup, he tells us. “I used all vintage stuff this time, including my old red P-Bass, which never leaves my side. Dave used it on the first album, and now he yells at me when I bring it out on the road! “I’ve had offers of gear endorsements from various bass companies, which is very kind of them, and I do in fact have a great deal with Ampeg for amps, but I just can’t get away from my Fender. I always think to myself ‘I’m going to leave it in the studio and sign up with this company’ but at the last second I just back off. It’s like a third arm for me. I like what I like, and that bass has the MA tone for me. Wait, we say - the actual one used by the late, great Burton? So what’s next for our man? Volume II - Power Drunk Majesty is out now on Nuclear Blast.